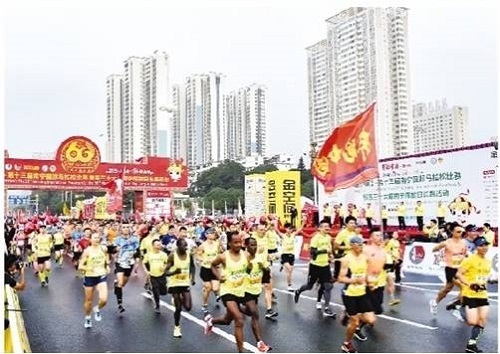 The 13th Nanning International Marathon and the 36th Nanning Liberation Day Long-distance Race was recently held at the Minzu Square of Nanning City. With the slogan of “Leaping Nanning Marathon, Running Zhuang Region”, the competition presents the ecological civilization of Nanning and promotes the sound and sustainable development of the national fitness campaign. In this year, competitors can appreciate the new landmarks along the both banks of Yongjiang River and Wuxiang New District when passing through the traditional running track of Minzu Avenue, including Fantawild Asian Legend, Confucius Temple, etc., and the fully-upgraded Pingle Cityscape Avenue and Yudong Cityscape Avenue.